Photo Captions: Felicitation: Mr. Jim Schellinger, Secretary of Commerce for the State of Indiana (left) being felicitated by Mr. Vijay Kalantri, Vice Chairman, World Trade Centre Mumbai at an interactive meeting. “Government of Indiana is excited about the growing partnership with India. 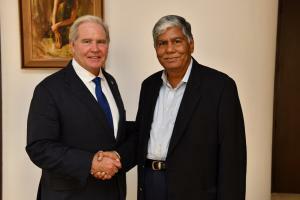 “Government of Indiana is excited about the growing partnership with India. In the last three years, our bilateral relation with India has intensified significantly. Our bilateral relationship is based on the shared values of honesty and trust professed by India’s Father of Nation Mahatma Gandhi. Indiana is exploring partnership with India in six major sectors viz. advanced manufacturing, aerospace & defence, agro-science, life science, logistics and information technology. Indiana has the second lowest cost of living in USA. This is my third visit to India and first visit to Mumbai and we are excited with the prospects for collaboration with Government of Maharashtra. Governor of Indiana Mr. Eric Holcomb will visit India in 2019 to strengthen our relationship further. We are exploring Sister-State partnership agreement with Maharashtra, on the lines of the one we have entered into with Karnataka,” said Mr. Jim Schellinger, Secretary of Commerce for the State of Indiana at an interactive meeting on ‘Strengthening Indiana-India Economic Relations’ organised by World Trade Centre Mumbai at WTC Mumbai. The Governor of Indiana is more outward looking than his predecessors. Indiana has attracted the maximum trade missions under this Governor, Mr. Schellinger added. Already, Indian companies such as WIPRO, Infosys and TCS have commercial presence in Indiana. For the first time in Indiana, the Governor has introduced 20-year programme to improve infrastructure. Indiana is at the crossroads of America as many inter-state highways pass through this state, it is home to the 2nd largest FedEx air hub worldwide. Indiana provides the only statewide port system with direct waterway access to two U.S. coasts. The meeting was also attended by Mr. Jake Miller, Secretary’s Director of Field Operations, Indiana Economic Development Corporation and Mr. Raju Chinthala, Ph.D, Founder & President, Indiana India Business Council. Ms. Rupa Naik, Senior Director, World Trade Centre Mumbai thanked Mr. Schellinger and his office for promoting trade and investment ties between Maharashtra and Indiana. The event was attended by representatives from trade and industry.